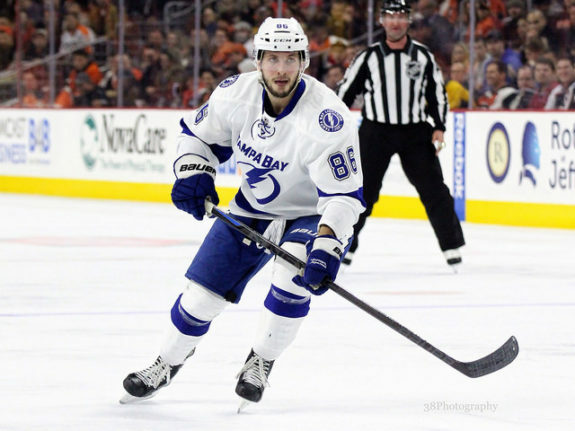 As an up and coming player in Russia, Nikita Kucherov was given the nickname – The Russian Rifle. One of my colleagues, Christopher Ralph, summarized the potential Kucherov possessed five years ago prior to the 2011 NHL draft when the Tampa Bay Lightning drafted him in the second round. Even then as a skinny 18 year-old kid, Kucherov showed the promise of a budding star. During the World Juniors 18 and under in 2011, all Kucherov did was amass 21 points (11 goals, 10 assists) which set the tournament record for most points. So, when this kid with the cool nickname and international performance to boot was drafted by the Lightning, his skills and abilities put him on the fast track to NHL stardom. Beginning in the Quebec Major Juniors, Kucherov, then 19, scored 29 goals and added 34 helpers for 63 points in the 33 games he played in the QMJHL. Almost two points per game! 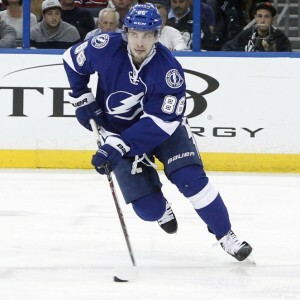 The following year the Lightning assigned Kucherov to their AHL affiliate, the Syracuse Crunch. He didn’t last in Syracuse very long, as he was called up to the show after 17 games with the Crunch. Perhaps the 24 points in those 17 games had something to do with that but in any case, Kucherov was now in Tampa playing with the Lightning as a 20 year-old. Most NHL players remember their first NHL goal. Kucherov is no exception. How many players can say they scored their first goal on a future hall of famer like Henrik Lundqvist? Kucherov with this first goal, showed just how wicked his shot could be. Although Kucherov remained with the big club the rest of that season, he struggled a bit adjusting to the speed and size of the NHL game. For a guy who likes to find a spot in front of the opposing net, at 5’11” and 180 pounds, he learned that NHL defenders were all too willing to shove him away from that perch. As coach, Jon Cooper was working to find the right line for Kucherov, the young Russian forward continued to work on his game. His speed came in to play on his forechecking. His innate hockey sense and extraordinary vision was seen with blind, no-look passes and he ended his first year in the NHL with nine goals and nine assists in 52 games. The Lightning made the playoffs that season but were unceremoniously swept in the first round by their Atlantic Division rival, Montreal Canadiens. There weren’t many highlights for the Lightning or their fans but some may remember who scored the first goal in the first game for the Bolts. 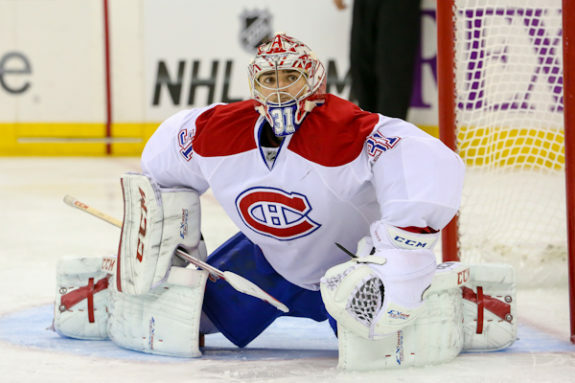 The Russian Rifle let a bullet of a shot go past Canadiens goalie, Carey Price that gave the Lightning a short lived Game 1 lead. The high for Kucherov of scoring his first playoff goal against arguably the best goalie in the game was as temporary as the lead he gave them as Cooper sat him as a healthy scratch in the final two games of the series. To his credit, Kucherov didn’t whine or complain or request a trade. He made a decision to come back the next season and prove to Cooper and his teammates that he would be a force to be reckoned with not only on this team but in the NHL. Last season, Kucherov was locked and loaded. Early in the season, Cooper put him on a line with 2013-14 Calder Trophy finalists, Tyler Johnson and Ondrej Palat and the Triplets Line was born. How good was this line? Kucherov tied Max Pacioretty of Montreal at the top of the NHL plus/minus statistic with a +38. Johnson with a +33 and Palat with a +31 were right behind them. The Triplets also scored 74 goals and 126 assists. During the 2015 playoffs, the Triplets continued their offensive mastery. Kucherov was third in the NHL with 10 playoff goals, trailing only linemate, Johnson and Patrick Kane of the Chicago Blackhawks. He was tied with Kane for the 4th most assists with 12 and had one less point that Johnson and Kane for total points in the playoffs. Kucherov himself had 29 goals and 36 assists in 2015. Talk about setting the bar high for yourself. So, what does the now 22 year-old Kucherov do? He is currently second on the team in goals behind Steven Stamkos with 24 and should finish with a career high of about 32. He is second on the team in assists behind Victor Hedman with 25 and should finish near his career high of 36. He is first on the team in points with 49 and has an outside chance of eclipsing the 70 point total for the season. Four years removed from playing in the World Juniors 18 and Under Tournament, Kucherov is turning into a sold 30 + NHL goal scorer. He has become one of the most reliable offensive weapons on the Tampa Bay roster that includes a genuine superstar in Stamkos. If Ben Bishop wasn’t having a stellar start to the season in 2015, Kucherov would be the odds on favorite for the team MVP by mid-season. There is still room for Kucherov to improve his game. Tampa Bay fans have seen tremendous gains in his defensive work especially in the neutral zone. His puck handling skills have continued to amaze and the confidence he shows in his shot grows with each game. He may not be a household name outside of Tampa but Kucherov has made significant progress in his game and before too long should be a perennial all-star in the NHL. This article was originally published in February, 2016.